For many years, Tamiya provided the best kit of the SU-122 in 1/35 scale, but that has changed. 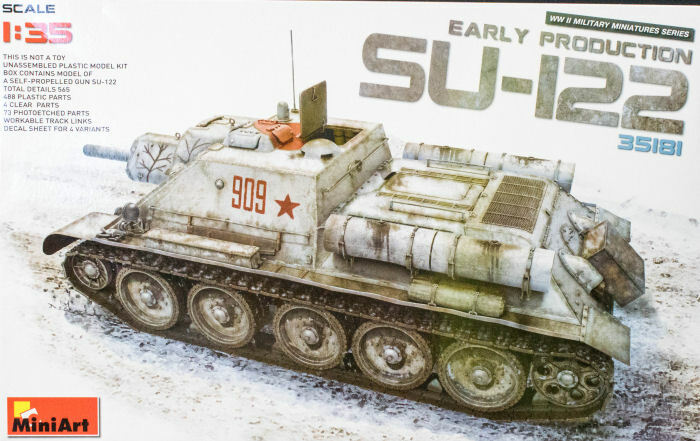 MiniArt has released the second of several kits of the SU-122, this representing the early production version of the vehicle. You'll recall that MiniArt previously released the initial production version of the SU-122 and it featured a FULL interior. This kit provides a lower cost and lower complexity option for those modelers who want the excellent exterior detail without all of the extra assembly for the engine and crew compartments. The kit is molded in gray styrene and presented on 56 parts trees plus two trees of clear parts (duplicate trees not shown) and one fret of photo-etched parts. According to the manufacturer, there are 492 plastic parts and 73 photo-etched parts in this box. MiniArt has listened and is providing color instructions with Ammo by Mig, Humbrol, Mr.Color, Testors, and Vallejo paints. If you want a nice kit of a Soviet Army mobile assault gun, this SU-122 is their nicest kit produced to date and as I mentioned above, they offer another version with the interior for those that prefer a more detailed build.